Graham Main (Executive Producer of Electric Theatre Workshop which runs Big Burns Supper, and the international show Le Haggis) on the structural problems behind the Creative Scotland fiasco. Creative Scotland’s recent debacle has gone from bad to worse. The organisation now appears to be completely adrift from the sector it was set up to support. Tensions started to mount as it transpired that they were attempting to remodel part of their system half-way through an assessment period. Chief Executive Janet Archer appeared in front of the Cultural Committee and was asked to explain a series of failures which took place over the last four weeks. Some felt she appeared genuinely apologetic during her opening address to the Culture Committee. She suggested that their funds were currently over-subscribed by ‘three to one’, fuelling continued discourse about whether the funding body will ever be able to please everyone. It cannot be called Creative Scotland if it only serves one third of us. The accusatory tone of the committee made it clear from the outset that this was a government that was fluent in the verbiages of cultural policy which made the dissection of the decision-making processes by Creative Scotland, even more difficult to comprehend. Normally an Arts Council can blame the politicians. However, the politicians went out of their way to make sure that culture was protected in the most recent budget which makes attributing blame incredibly difficult. Their continued advocacy for the arts in Scotland resulted in a 21.2% uplift which was announced in December. This isn’t the first time that a wound has appeared between those that create the work and the cultural policy makers that fund it. This is only a parody of the continued dispute that has plagued the Scottish arts funding system since its devolution from the Arts Council of Great Britain over the last forty years. The Arts Council model has enshrined UK cultural policy, a post-war sibling of the welfare state that is envied on the world stage, centred on the lives of ordinary men and woman. The origins lay in the underground bunkers of the Blitz as a sentiment to ‘rally morale’ while London’s physical and social infrastructure was battered from above. Musical recitals played out in Underground Stations which soothed the human spirit beneath. This gave rise to the birth of the Arts council movement which spread to each nation in the decades to follow. Creative Scotland asserts that it wants to build a creative nation shaped on equality which appears to be echoed in sentiment by a sector that states firmly that it wants to see an end to the dominance of white middle class cultural production. Yet where in Creative Scotland’s portfolio is there any evidence to suggest that it is willing to fund anything other than the type of culture it has always tended to support? It’s roll call of honour has become heavily guarded by an exclusive peer matrix. Chance cards are given out very rarely. Preferring to fund only a certain type of culture, rejecting ideas because its main frame finds it hard to process anything which has been socially constructed by anyone other than its networks of peers, which it relies on heavily to justify its budget position. This has led to a sanitisation of our culture which forces us to fabricate identical versions of ourselves, caused by a managerialism in the arts sector which Creative Scotland have been part of throughout the last decade. 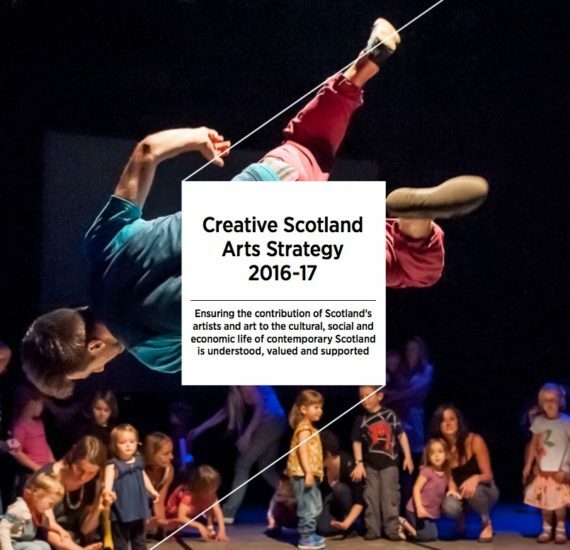 Creative Scotland has been forced to lead the cultural sector towards managerial strategies of goals, aims, outcomes and outputs because governments still need us to rationalise investment to arts and culture, rather than accepting that the benefits are wide spread, and that Scotland is all the richer because of it. Instead it has layered itself in corporate managerial jargon, failing to connect with anything other than the portfolio of work or the projects that it supports because it has little capacity to do anything else. The longer-term result is a free-market cultural economy based on competitiveness and tendering, giving rise to a tone of voice that makes the arts body appear cold, heartless and unapologetic about taking the toys off the baby. The real problem though is the increasing stake on Creative Scotland’s central funds by mega institutions who receive millions of pounds worth of subsidy because they are thought to be the integral ‘pillars and columns’ by which we seek to validate culture at large. We could hazard a guess to say that at least 70% of the portfolio for regular funding is unlikely to ever change because it wouldn’t make sense to build our nation’s cultural capital and then destroy it for the sake of it. Regular funding was designed to give projects the stability to be able to manage resources more effectively. It was thought the three-year commitment would genuinely help Scotland’s cultural assets strengthen. In the last round of RFO which took place in 2014, there were 264 organisations that applied for 119 places which decreased by 31% to 184 organisations applying for 121 places this time. 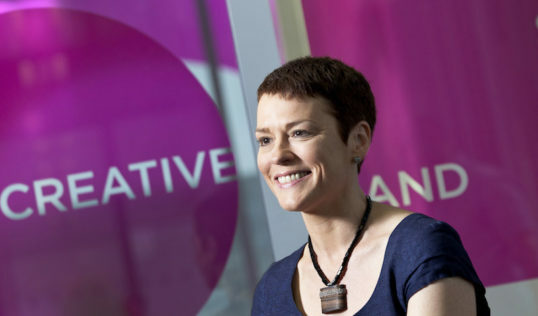 Creative Scotland’s after-care service for the unsuccessful applications was not existent. The loss of 80 ground-breaking cultural manifestos from our economy should send alarm bells to politicians and policy makers alike. Perhaps a mentoring system for the unsuccessful applicants rather than focusing on strengthening the resilience of a select few. Creative Scotland needs to find a renewed compassion for exclusion in our delicate cultural eco-system.Those that lost out in the current budget will be left examining their proposals and business plans wondering if the writing could have been on the wall for some time? Arts Council England offer a traffic light system which helps companies understand whether they are about to enter dark waters with transitions covered by periods of needs improvement. They also have a very clear process in place to help build the ideas that don’t get through, but nothing like that exists at Creative Scotland. Local authorities are still the biggest sponsor of culture across Scotland, each of whom have rigorous in-house external funding units capable of processing the checks and balances needed to safe-guard third sector investment. At present only 1% of the RFO portfolio is spent South of the central belt; with little justification ever offered beyond the parables of ‘three-in-one’. Is it going to be necessary for us to implement a fiscal zoning of cultural investment which is distributed through a Northern, Central and Southern Creative Scotland to make decisions about projects happening in their part of Scotland? Why must we continue to play this game of creative roulette when we all know that at least 70% of the funds will remain at a standstill? Perhaps we might even be united in agreeing that we could create a cultural body that nurtures our artistic talents by enabling us to harness our creative energy collectively. A national body that does not seek to divide us through strategic competitiveness but instead promotes collaboration and respect. In Brazil for example, there is no state funding of the arts – instead the government has created a tax incentive for companies where a percentage of the tax profit is sponsored to the arts. The model tries to offset the continued dependency on the state by promoting models of philanthropy and corporate responsibility. Creative Scotland in its current model hasn’t got the capacity to explore models like this because they are charged with the distribution and justification of funding on behalf of the government. They exist to safe-guard the checks and balances that stop ensure that our culture is free from political bias. If we truly want to empower Creative Scotland to achieve as much as we want it to – then the government needs to remove as much of the instrumental shackles as it can. Creative Scotland has some really hard working committed souls working in the organisation who genuinely want what’s best for Scotland. Regardless of which direction the pendulum of our cultural system begins to swing. Let’s make it as simplistic as possible for the ordinary men and woman who gift us their taxes to enable the power of creativity to flow freely across these shores. Creativity shouldn’t be this difficult. As with other key public services, for example, health, education, transport, it is time for a return to the basics, examining yet again why we do things, how best to do them and what actually needs doing. This appears to miss the bigger picture regarding Scotland’s cultural landscape. 1. Creative Scotland’s 21% uplift included £10 million for a Screen Unit. £6.6m for Regular Funding. Overall Creative Scotland’s budget remains at standstill, with Scottish Government’s overall funding of culture still miniscule and Lottery funding falling due to Westminster’s deregulation of lotteries. 2. Those Local Authorities who are going to help “shoulder the administrative burden” are currently cutting the non-statutory cultural funding, staff and services from their under pressure budgets. 3. ’80 cultural manifestos’ have been lost from the economy? Is this the number of organisations who didn’t apply for this recent funding round compared to the previous one? Creative Scotland does have other funding programmes, maybe, just maybe, some of those organisations are funded through the other programmes. 4. “only 1% of the RFO portfolio is spent South of the central belt”. Is this perhaps an indicator of a low number of applications rather than a bias against the south of the country? It would be helpful to have an informed discourse about how we value arts and creativity in Scotland and, if so, how we support this across national and local agencies at a time when public funding is shrinking and cultural organisations are sniping at each other over the pennies. We cannot have an informed discourse on the arts in Scotland if we myopically focus on one funding programme run by one agency. I welcome and support what you say Lizzie, especially in your final para on the need for ‘an informed discourse…’. I have more than a couple of times pressed the point that such a discourse needs to involve the ‘sector'(?) asking real questions of itself regarding what it wants out of engagement in public funding. It long ago was no longer enough to exclaim ‘government should just give us the money and trust us’. I fear that many will simply stay in the collective comfort blanket of kicking Creative Scotland.. or whatever ‘one agency’ the collective focus is on. Accounting is welcomed as a creative art, then… There’s a wheen of percentages on the Creative Scotland website. Applying the above litmus test to our game industry output should hopefully find games which tell our history from different perspectives, allow players to get stuck into present problems, and model potential futures. For example, it should be easy to find games based on the Highland Clearances (a topic recently covered on this site). My personal goal is to find and play an anti-colonial independence struggle against the British Empire. Now that would be worth funding. Creative Scotland was able to find a million pounds to give to Netflix, a foreign-owned mega corporation. Lizzie Castle makes a couple of important points – the Scottish Government deserves recognition for keeping up the level of cultural spending, but the additional money is for the film industry. I’m not knowledgeable enough to know if that is a good investment, but it seems to be a totemic issue for governments. As Lizzie says, local authorities are cutting back their cultural provision to help meet statutory obligations. Many local authorities have outsourced their cultural venues to arms-length charitable trusts. The recent Barclays review concluded this was just one part of the public sector subsidising another part, but it’s been concluded that the sector is now so fragile that removing tax relief could see the end of this local provision. Really? The author wants to cut state funding and rely on corporate investment a la Brazil? 40 years and counting a professional working in the creative industries. A dozen of those spent lecturing (by invite) in my particular craft and over three decades freelancing in it. Born in Springburn, raised in the Red Road the son of a single parent… and in the 31+ years since I struck out ‘on ma ain can’ I’ve never received a blind penny – not in cash nor kind – of assistance or encouragement from any government (national or local) body. And, especially in the beginning, some help would have been appreciated. Quite the reverse; at times certain of the ‘cabals’ have been quite obstructive; they don’t like scheemies running rings ’round them you see. They make a lot of noise, wave a lot of banners, hold a lot of expensive lunches and regularly kiss each-other’s aspidistras; but all it means is a carve up among the elite members of the Milngavie Mafia. …Life becomes much simpler when you start to understand that assistance and encouragement is only for the ‘special bairns’ that sate some political appetite or another. Or are well-connected and well-placed for extra helpings of what they haven’t earned and don’t really need or deserve. – Like the other quangos that are supposed to encourage more general enterprise; Creative Scotland aren’t now and never have been about what it says on the tin! And it amazes me that anyone imagines they ever were or could be. Aye sure, it’s our money as taxpayers they’re divvying up; but that’s politicos for you. Life ceases to be difficult when you just get your head down, ignore the lot of them and get on with whatever it is you should be getting on with.